Sports Bar & Cantina is the best place to get a great meal, partake in some drinks, host a party, or enjoy the game. We just opened in 2017, and already our unique atmosphere and outstanding service have made us Odessa’s go-to sports bar and grill. Whether you want to party with your friends or you simply want a place to relax and watch a game, we have you covered. Although we just opened in 2017, our owners have over 30 years of experience in the restaurant industry. Zeke understands what people want out of a sports bar, and his business partner Jose D. knows how to provide a fresh and comfortable atmosphere. Together, Zeke and Jose take pride in making Halftime Grill & Cantina the best place for a great time in Odessa, TX! 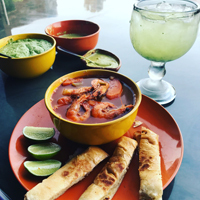 From our selection of unbeatable drinks and food to our friendly atmosphere and great service, you’ll love Halftime Grill & Cantina. 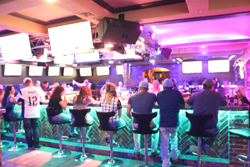 Sports Bar: Watch your favorite teams with over 30 large HD TVs. Bar & Grill: Enjoy our famous seafood dishes, including lobster ceviche, grilled salmon and shrimp, steak ribeye and shrimp, oysters, and more. Restaurant: Stop by our patio to spend time with family and friends. Nightclub: Sip something fresh when you visit us for drinks. Party Venue: Make us the location for your next special event! Each day, we strive to make Halftime Grill & Cantina the best place for food, drinks, and a great time. Be sure to stop by soon to see why everyone is talking about Halftime Grill & Cantina.